Although the single currency retreated after running into resistance at 0.9033, as low has been formed at 0.8746 late last month, reckon downside would be limited to 0.8850-55 and bring another rebound later, above said resistance at 0.9033 would add credence to this view, bring a stronger rebound to 0.9050-60 and possibly 0.9080, having said that, reckon upside would be limited to previous support at 0.9115-20 and price should falter well below resistance at 0.9203, bring another decline later this month. 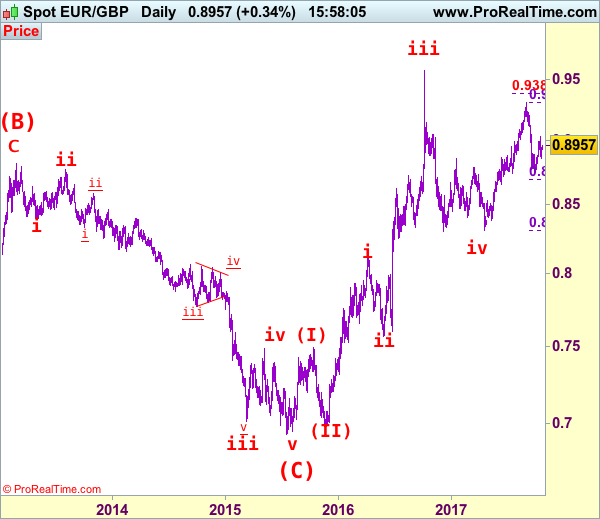 Our latest preferred count is that the wave V of a 5-wave series from 0.5682 ended at 0.9805 earlier and major from there has possibly ended at 0.8067 as A-B-C-X-A-B-C. We are keeping our view that the entire correction from 0.9805 has possibly ended at 0.7756 and as labeled as the attached daily chart and impulsive move from 0.9084 has ended at 0.6938 as a 5-waver which marked as the (C) wave, recent impulsive rise is labeled as (I) (II), (i) (ii) series, indicated upside target at 0.9084 had been met, the retreat from 0.9576 suggest wave iii ended there and next upside target for wave v of (III) should head towards 0.9700 but price should falter well below parity . On the downside, expect downside to be limited to 0.8900 and 0.8850-55 should hold, bring another rebound later. Below 0.8800-05 would suggest the rebound from 0.8746 has ended instead, bring weakness to 0.8770-75, break there would confirm and bring retest of 0.8746, once this support is penetrated, this would signal the decline from 0.9307 top has resumed for correction of early uptrend to 0.8690-95 (61.8% Fibonacci retracement of 0.8312-0.9307) and possibly towards previous support at 0.8652. 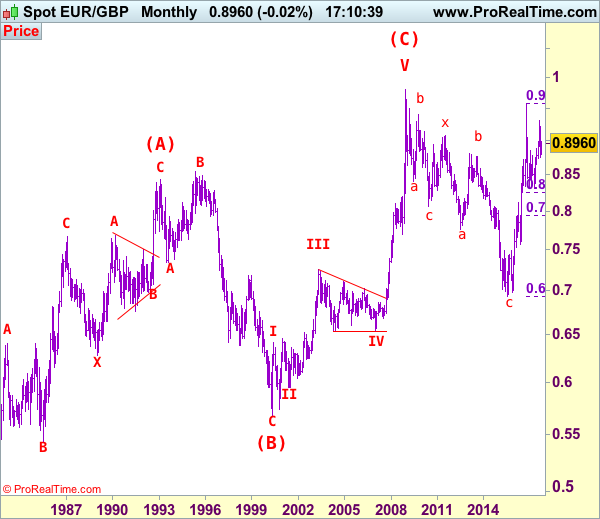 Euro’s long term uptrend started in Feb 1981 at 0.5039 and is unfolding as a (A)-(B)-(C) move with (A): 0.8433 (Feb 1993), (B): 0.5682 (May 2000) and impulsive wave (C) should have ended at 0.9805 with wave III ended at 0.7254 (May 2003), triangle wave IV at 0.6536 (23 Jan 2007) and wave V as well as wave (C) has ended at 0.9805. We are keeping an alternate count that only wave III ended at 0.9805 and the correction from there is the wave IV and has possibly ended at 0.6936, however, it is necessary to see a daily close above resistance at 0.9576 in order to change this to be the preferred count.